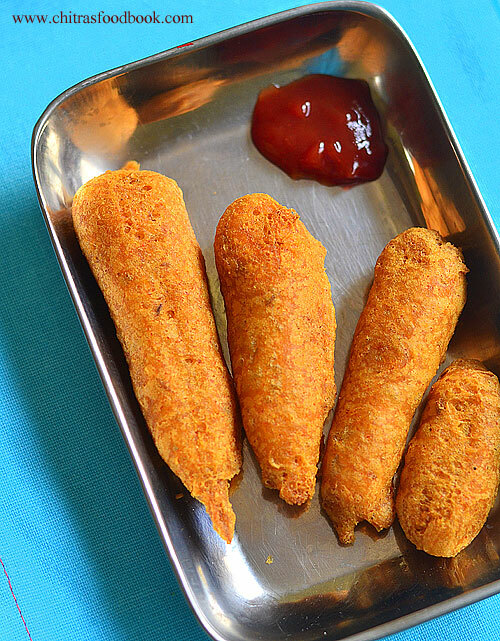 Vazhaipoo cutlet is an interesting deep fried snack prepared using vazhaipoo (banana flower in English) and cooked potato as the base ingredients. Recently I got a big banana flower from Salem. As usual I prepared Vazhaipoo usili and vazhaipoo dosa. Still I had a cup of leftover banana flower. So I tried this Vazhaipoo cutlet recipe for the first time. It came out so well with a soft interior and crispy exterior. No one could find out this cutlet is prepared with vazhaipoo. Even kids would love it. In this recipe, I have ground the cooked banana flower to a paste and added it with mashed, boiled potato. So the taste of vazhaipoo won’t be dominant. Anyone would love to eat it. Raksha relished it with tomato ketchup. 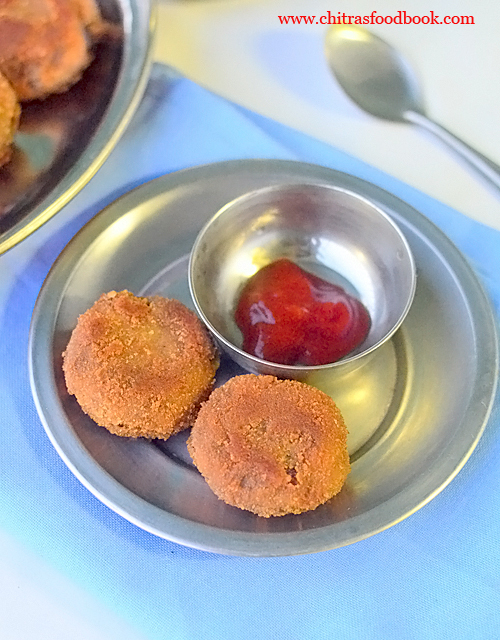 Friends, do try this vazhaipoo cutlet recipe for a change and enjoy. Ok, here you see banana flower cutlet recipe with step by step pictures. If you are interested see my post on how to clean banana flower. 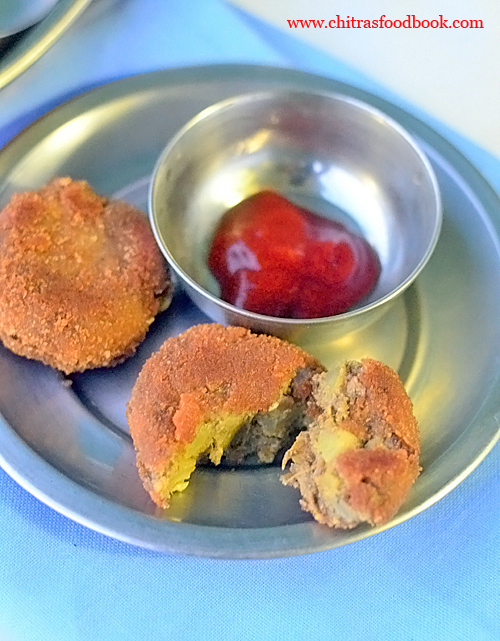 Vazhaipoo cutlet recipe / Banana flower cutlet recipe - An interesting, healthy snack recipe. Water - to make paste. Wash and clean vazhaipoo. Cook in required water till soft. Drain the water and grind to smooth paste adding little water. Cook and peel the skin of potato. Mash it well. Heat oil in a kadai. Add crushed fennel seeds, chopped big onion and saute well. Add ginger garlic paste and saute till raw smell goes off. Then add ground vazhaipoo paste. Saute till water content is removed. Then add mashed potato, red chilli powder, salt and garam masala powder. Mix well and cook till it becomes a whole mass. If the mixture is too wet and watery, add maida for binding. Garnish with coriander leaves. Remove and let it cool. Make a thick paste of corn flour for dipping the cutlet. Make round or heart shaped cutlet. Dip the cutlet in corn flour paste. Coat in bread crumbs. Shallow fry both the sides in a kadai. Drain in a tissue paper. Pressure cook potato in required water. Peel the skin, mash well and set aside. Wash and clean the vazhaipoo florets by removing the black stamen (kalan). Chop roughly and cook in required water till soft. Drain the water and set aside. To make homemade bread crumbs, just grind the corners (brown part) of bread to a fine powder. Keep in a plate. 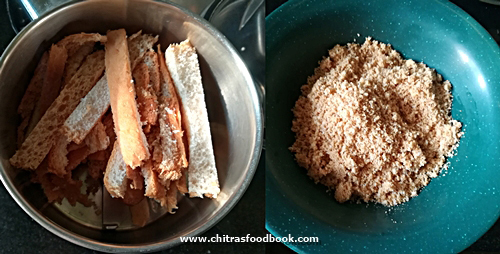 Grind the cooked vazhaipoo to a smooth paste adding little water (For variations, you can skip cooking and grind it raw). Heat oil in a kadai. Add crushed fennel seeds. Add finely chopped onion and saute till transparent. Add ginger garlic paste and saute till raw smell disappears. Add the ground vazhaipoo paste. Saute till its water content is absorbed. Add turmeric powder, red chilli powder, garam masala powder, salt and mashed potato. Mix well in low flame. Keep mixing till everything comes together like a dough. If there is wetness in the mixture, add some maida or rice flour to make a dough. Lastly add coriander leaves, mix well. Switch off the flame and let it cool down. In the mean time take corn flour in a bowl. Add some water and make a thick paste. Take bread crumbs in a plate. Now take the cooled cutlet mixture. Make round or heart shapes as you like. Dip one cutlet in corn flour paste. Immediately coat in bread crumbs. Arrange in a plate. Follow the same for remaining cutlets too. Heat oil in a kadai to shallow fry the cutlets. Arrange 4 to 5 cutlets per batch. Cook in low flame till golden brown on one side. Flip the cutlet and cook the other side too. Remove in a tissue paper to drain the excess oil. Serve warm with tomato ketchup.Enjoy ! Adjust the quantity of chilli powder as per the taste. For variations, you can also add mashed vegetables along with potato. 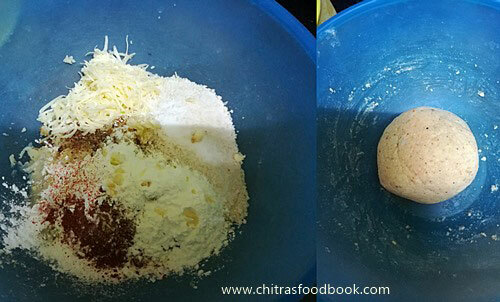 Addition of maida or rice flour helps for binding cutlet dough. You can dip in corn flour paste and bread crumbs twice to make super crispy exterior. 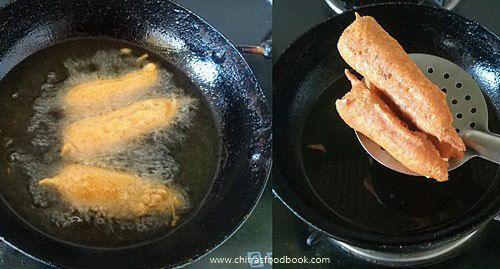 If you are conscious about oil, you can just cook the cutlet in a dosa pan with little oil. 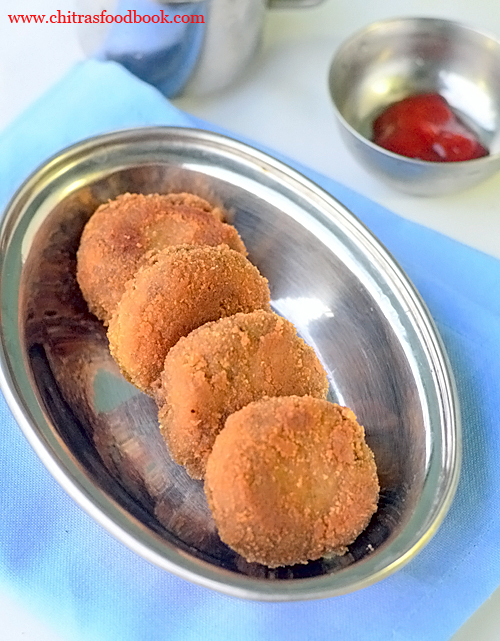 Try this interesting, healthy vazhaipoo cutlet recipe and enjoy ! Technorati Tags: vazhaipoo cutlet,vazhaipoo cutlet recipe,banana flower cutlet,banana flower cutlet recipe,vazhaipoo recipes,banana blossom cutlet,banana flower recipes. This is our South Indian style bajji recipe with baby corn. 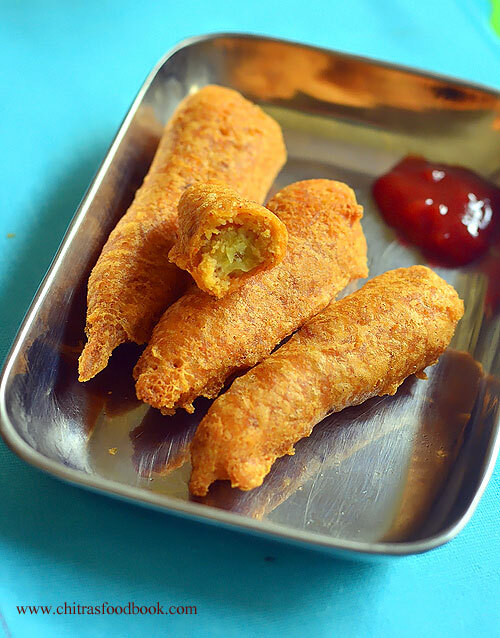 Baby corn bajji in Tamil also known as baby corn fingers was in my try list for years. Long back I had posted baby corn golden fritters / baby corn 65 which is a super hit recipe in my blog. 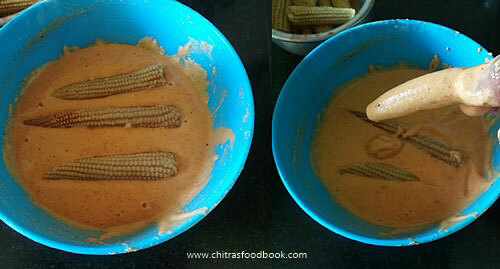 After that I din’t post any baby corn snack recipe for long time. As summer vacation is started here, Raksha told me to make some bajji or bonda for her evening snacks. So I wanted to post this baby corn bajji and made it. I used besan flour and rice flour in the ratio of 2:1 and made bajji batter in thick flowing consistency. It came out very well with crispy exterior and soft interior. We loved it very much. Friends, do try this easy, yummy, crispy baby corn bajji for your kids during this vacation and share your feedback with me ✋. Check out my homemade bajji bonda mix, onion bajji, potato bajji, Ajwain leaf bajji, Raw banana bajji, Andhra mirapakaya bajji, Chilli bajji. Peel the baby corn and discard the skin. Pressure cook the whole baby corn in high flame for one whistle OR boil in water till it becomes soft. In a wide bowl, mix all the ingredients except cooking oil to make bajji batter. Dip the cooked baby corn in the batter. Deep fry in oil on both the sides. Remove when it turns golden in color. Serve with coconut chutney or tomato ketchup. Peel the skin of baby corn and wash it. In a cooker base, add 2 cups of water. In a small bowl, keep the peeled baby corn and add very little water to it. Let it pressure cook in high flame for one whistle or cook till it becomes soft but firm. Remove the bowl from the cooker. Drain the excess water if any. Keep it aside. Some people use raw baby corn to make bajji. So pressure cooking is an optional step. But I love to have soft baby corn. So I cooked it. In a wide bowl, mix besan flour, rice flour, red chilli powder, garam masala powder, hing, salt, baking soda and mix well. 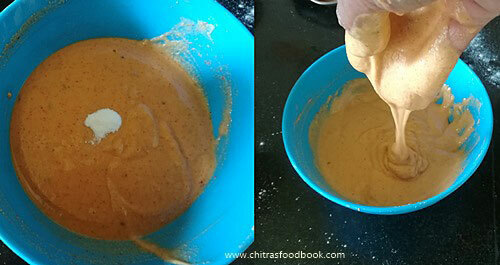 Add water and make thick bajji batter in flowing consistency. Set aside for few minutes till oil gets heated. Heat cooking oil in a kadai. Drop a pinch of bajji batter. If it sizzles and rises to the top immediately, heat of the oil is just right. Take one cooked baby corn. Dip it inside the batter, coat it well and take it out by holding the tail part. Drop in the hot oil. Repeat the same and put 2 to 3 bajji in one batch. Flip and Cook both the sides till it turns golden. Remove the bajji in a tissue paper. Enjoy with coconut chutney or tomato ketchup ! If you want to use less rice flour, use besan and rice flour in the ratio of 3:1 instead of 2:1. You can add a pinch of food color to get a bright colored bajji like in teashops. Adding baking soda helps to make puffy and soft bajji. 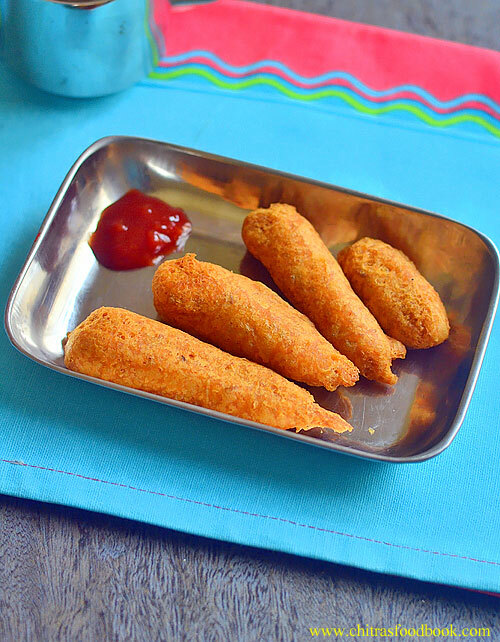 Enjoy this easy, yummy baby corn bajji with tomato ketchup ! 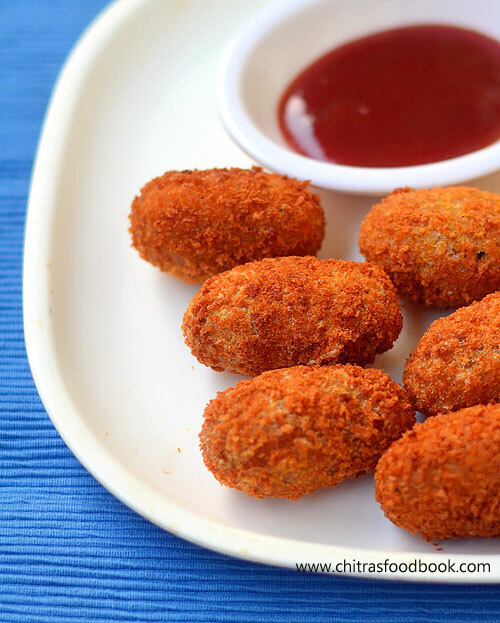 Potato nuggets / Potato cheese balls is an easy, yummy, kids friendly snack/starter recipe. Most of you would have tried Mccain potato nuggets at home for kids birthday parties and small gatherings. But I haven’t tried store bought ones. For the first time, I prepared these potato nuggets recipe for Raksha’s birthday party after watching a YouTube video. All the kids loved it very much with tomato sauce. This deep fried snack became a super hit among everyone. Its a good crowd pleaser. 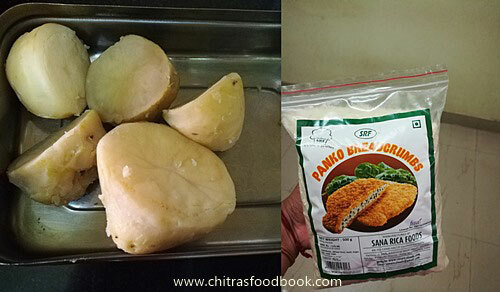 Recently I bought Panko bread crumbs from Metro, Electronic city. It helped to make these nuggets very crunchy and crispy for an hour. Boiled and mashed potato, cheese, bread crumbs and Italian spices are the major ingredients used in this recipe. You can also make it without cheese and go for baked version if you are calorie conscious. 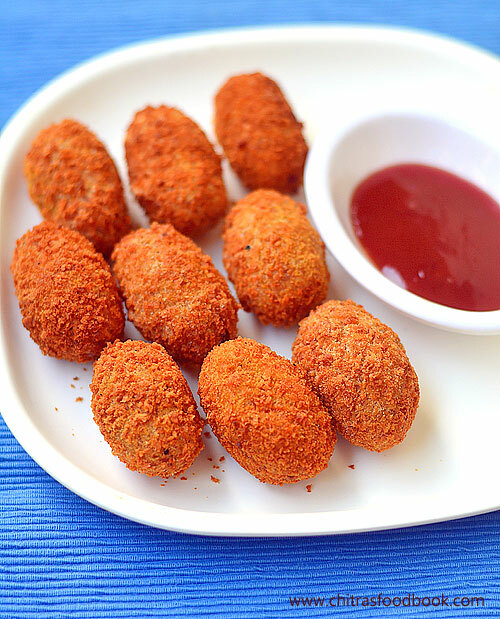 Friends, do try this yummy potato cheese balls for your kids as evening snack during this summer vacation. They will love it for sure. Ok, lets see how to make Potato nuggets with step by step pictures. Check out my corn cheese balls recipe similar to this. Corn flour + Water – 2 tbsp + 1/4 cup to make paste. Wash and pressure cook potato in low flame for 2 whistles. Peel the skin, mash and set aside. In a bowl, take the mashed potato, grated chees, bread crumbs, corn flour, oregano mix, chilli flakes and salt. Mix well to make a dough without adding water. Cover and let the dough rest for 1 hour in refrigerator. Take the dough and make shapes. Coat in corn flour paste and bread crumbs. Arrange in a plate. Cover and let it chill for 30 minutes in refrigerator. Deep fry in oil under medium flame till it turns golden in color. Serve hot with tomato ketchup. Wash and pressure cook potato adding required water. Cook in low flame for 2 whistles. Remove and peel the skin of cooked potato. Mash it well and set aside. In a wide bowl, take the mashed potato, corn flour. bread crumbs, grated cheese ( Pizza cheese or Cheddar can be used), oregano mix, chilli flakes and salt. Add garam masala powder if using. Mix well and make dough without adding water. Cover the bowl with a lid and refrigerate for one hour. Take small balls and roll into cylinders as shown in the figure below. In a small bowl, mix corn flour + water to make a paste. Take bread crumbs in a wide plate. Dip the prepared cylinder shaped nuggets into the corn flour paste and then roll in bread crumbs to coat well. Arrange all the nuggets in a plate. Cover and Let it rest for 30 minutes in a refrigerator. Heat oil in a kadai to deep fry. Drop a pinch of dough to check the oil temperature. If it rises to the top immediately, oil temperature is right. Now lower the flame to medium. Drop 3 to 4 nuggets in each batch. Cook patiently in low to medium flame till it turns golden. Flip it whenever needed. Do not keep the flame high because the outer layer browns faster and cheese starts to ooze out from the balls. Remove when it turns golden in all the sides. Drain the excess oil in a tissue paper. Serve with tomato ketchup. Enjoy ! Panko bread crumbs helps to retain the crispness for long time. But you can use homemade bread crumbs too by grinding 4 to 6 bread slices in mixie. You can also double coat the corn flour paste and bread crumbs as I did for my corn cheese balls recipe. Adjust the quantity of chilli flakes and oregano as per your taste. Addition of garam masala is optional and not mentioned in original recipe. I used it. You can make this nuggets ahead and freeze till use. For this, roll the nuggets in bread crumbs and refrigerate it till you deep fry it. I used Cheddar cheese in this recipe. You can use any processed cheese, mozarella, Parmesan etc. 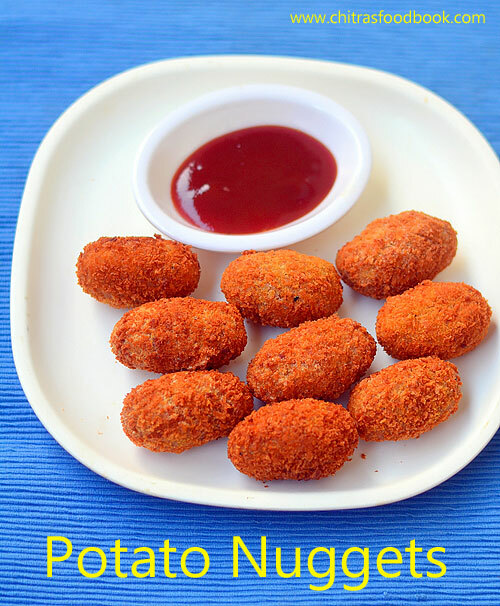 Try this easy, yummy potato nuggets for your kids. They will love it ! Avarekalu season is started in Bangalore. Every year I never forget to try some interesting avarekalu recipes during this season. My School moms friends are the biggest inspiration & source for my Karnataka recipes. This year they suggested me to try Avarekalu uppittu & avarekalu mixture recipe. 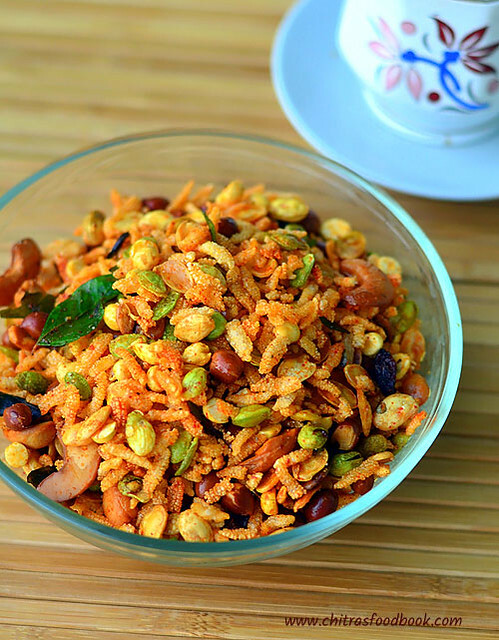 Avarekalu mixture is an yummy South Indian mixture recipe prepared with the combination of deep fried avarekalu(Hyacinth beans / Flat beans/ Indian lilva beans in English, Mochakottai in Tamil, Surti papdi in Hindi), poha, peanuts, nuts and raisins. One can find it easily in most of the snacks and savory shops in Bangalore at this time. In many places, people make this mixture only with avarekalu. But I like to add all the other ingredients to yield more quantity and taste. 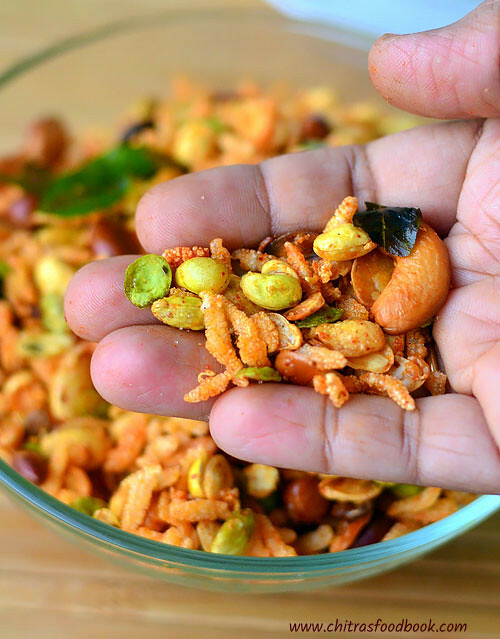 Hitikida avarekalu (Skinless beans) works well for this mixture recipe. It was so good and crunchy to taste. I am sure kids and adults would love to munch it during tea time. It would be ideal for their snacks box as well. Even though its high in calories, its a very tasty indulgence. 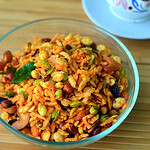 You can also make this mixture with dry avarekalu/ dried beans by soaking overnight in water. Do try this yummy mixture recipe in this avarekalu season. You will love it. Ok, lets see how to make Avarekalu mixture recipe with step by step pictures. Wash and soak avarekalu in water overnight or for 6 hours. Peel the skin and keep it ready. Spread them in a cloth. Pat it dry. Heat oil and deep fry avarekalu in batches. Cook till bubbles cease. Remove them in a paper towel. Deep fry poha, peanuts, cashews, dry grapes and fried gram dal one by one and add to fried avarekalu. Add salt, red chilli powder and hing. Mix well. Wash and soak avarekalu in water overnight or for 4 to 6 hours. Peel the skin by pressing the avarekalu between your thumb finger and pointer finger. Skin comes off easily. Collect them in a bowl. You can also split them into two halves if you like. Refer the picture below. Spread the peeled avarekalu in a cotton cloth and pat it dry to remove its moisture completely. Make sure its dry. Do not rest the avarekalu in the cloth for long time. It will become hard to eat after frying. So its enough if you just pat it dry nicely. Heat oil in a kadai to deep fry. Fry avarekalu in 3 batches. When you put the avarekalu in oil, it settles down in the bottom of oil with lots of bubbles. Once its cooked and becomes crispy, it will float on the top of oil without bubbles. You can remove them at this stage. Cook in medium high flame and keep tossing gently till its crispy else the entire mixture will become soggy the next day. So please be patient while frying avarekalu. Each batch takes nearly 5 minutes but its color won’t change. Drain the oil and Remove the avarekalu in a tissue paper. Now deep fry poha till crispy and add to fried avarekalu. Then deep fry peanuts, cashews till golden and remove them. Collect them in the avarekalu bowl.Deep fry dry grapes till puffy. Remove and add to the mixture. Lastly fry the fried gram dal just for a minute and remove it. Fry curry leaves and add it. Mix all the fried items in a wide bowl. Add salt, red chilli powder, sugar and a pinch of hing. Toss it to coat well. Serve with hot coffee/tea. Enjoy ! Store in an air tight box after it comes to room temperature. Enjoy up to a week! For variations, you can roast Kellogg's corn flakes in 2tsp oil and add to the mixture instead of poha. Frying the avarekalu properly is the key to make perfect crispy mixture. If you rest the avarekalu in the cloth for long time, it loses all the moisture and becomes very dry. So it will taste hard once you deep fry. So it is enough if you just pat it dry. Adjust the quantity of chilli powder as per taste. For variations, you can also add 2 pinches of chat masala powder and black salt. 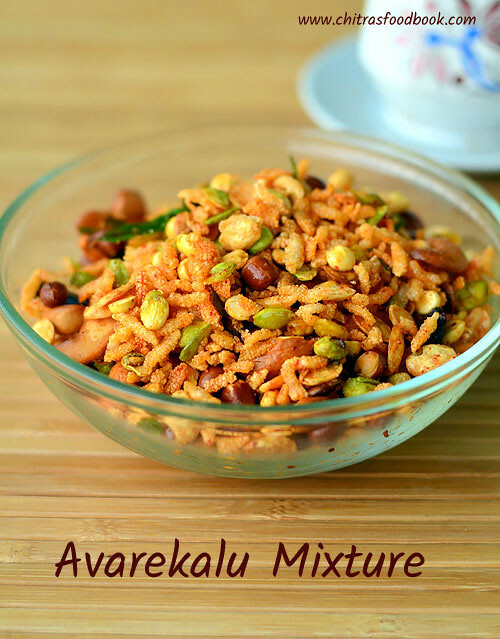 Try this easy, yummy, crispy Avarekalu Mixture and enjoy with tea/coffee !